What will it take to safeguard the future of the endangered cheetah? 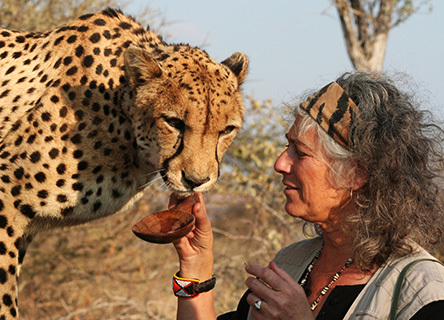 Dr. Laurie Marker is a pioneer in cheetah research who strives to help restore the dwindling cheetah population. As a young woman, Dr. Marker worked at a park called Safari West and became fascinated with cheetahs. In fact, she slept with a cheetah named Khayam curled next to her bed. Later, on research trips to Namibia, Dr. Marker learned about the shrinking population of wild cheetahs and discovered how limited genetic diversity, along with clashes with local communities, threatened their survival. 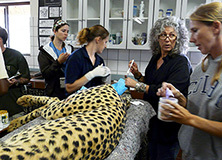 In 1991, Dr. Marker sold most of her belongings, moved to Namibia, and cofounded the Cheetah Conservation Fund (CCF). Dr. Marker’s first trip to Namibia was in 1977. She arrived with a captive-born cheetah she hoped to return to the wild. This first-of-its-kind research provided insight into the process of reintroducing captive-born cheetahs into the African landscape. The Green Living Project visit the CCF in Namibia to film Earthwatch volunteers working with Dr. Marker to help save the world's fastest land animal. Earthwatch volunteers work alongside staff at the Cheetah Conservation Fund, taking part in cheetah surveys, husbandry, and educational activities. "I set up Cheetah Conservation Fund back in 1990 to find out more about how cheetahs could live on the landscape with the people on whose land they were living."